The Flight Instructor certificate allows individuals to provide training to pilots. Long considered the doctoral degree of aviation, the flight instructor certificate is a mark of distinction that few pilots ever attain. Many pilots wishing to enter professional aviation positions become Certificated Flight Instructors in order to build the necessary experience. and of course, getting paid to fly! Tuition: $2,000 course fee + $400 consumable materials fee (ordered prior to course start). If two students register together for the same class, take a discount of $200 each. Your enrollment includes all ground & flight instruction. Spin Endorsement: If you come with a spin endorsement, it must have been issued within the preceeding 90 days prior to the date of your checkride. If you need a spin endorsement during your training, plan on coming a day earlier to go out with our aerobatics instructor to do the CFI spin training. You'll fly in a fully aerobatic tailwheel aircraft and pay him directly $600 for the 1/2 day of training (includes all ground training and flight training). Airplane Rental: Flight Instruction included, aircraft is not included. Rental aircraft can be arranged for non owners. Basic aircraft can be obtained for $95-$115 per hour. Any required endorsements are included (high performance or complex) at no additional charge. For budget purposes, assume 10 hours for those who are right seat proficient. For expenses related to room and board, see the sample budget for personal expenses during training. It is recommended that you enroll 1 month prior to the start date of your program. This is a well organized program that requires you to accomplish study tasks according to a 4 week schedule prior to the start of your training program. 20% Non-Refundable Deposit + Consumable Materials fee is required to guarantee your program date. If you cancel at any time prior to your scheduled date, we will apply your deposit to a future date only if we are able to fill your reserved spot with another student. The balance due is paid on the first day of training. Ground transportation related to arrival/departure in Tampa is provided. If you stay at the recommended hotel, daily transportation is provided. Weather delays happen sometimes, but in the event weather causes a delay in your training, there are no additional instructional charges. We constantly evalute our competitors to ensure that our program provides the highest quality at the most reasonable cost in the country... compare for yourself. We're not beat by anyone. Safety: techniques for teaching safe flight are emphasized by your instructor who is also an aviation safety counselor and speaks to groups on these topics frequently. A highly qualified ATP-rated senior instructor with 100% pass rate. What are the prerequisites to becoming a CFI? Students seeking a rating are required to prove US Citizenship and Flight Instructors must examine and keep a copy of a US Birth Certificate, US Passport, or Naturalization papers. Citizens of other countries are required to register with the Transportation Security Administration prior to beginning training. What is the path to becoming a CFI? Make the committment to a very difficult course of study. This is not for the weak. Purchase a written exam study guide and begin learning. There are a variety of great books on the market. Find a source of training. Because this is a teaching certificate, you must really know your "stuff" to be able to teach it. That means lots of ground training to prepare you. Expect a 5:1 ratio of ground to flight instruction to become properly trained. Commercial Pilot Certificate with Instrument Rating and 3rd Class Medical Certificate or better. Flight Instructor Airplane and Advanced Ground Instructor written exam results. Fundamentals of Instructing written exam results or Advanced Ground Instructor certificate. Bring: consumable materials kit, consisting of 6 text books + CFI Academy Binder. 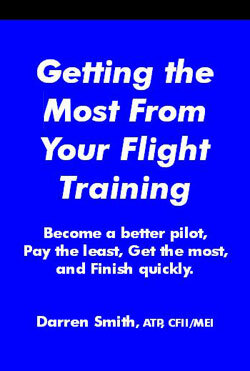 Complete & Bring: CFI Academy pre-test. Review, Read, & Bring: Jeppesen textbook read cover to cover, minimum required knowledge to begin CFI academy. This textbook is included in your consumable materials kit and must be read prior to arrival. We can predict if someone will pass their checkride if they have read, understand, and can explain everything from this textbook. Review, Read, & Bring: CFI Academy Binder, with information, QRC, and PTS for each pilot rating; articles; study schedule; handouts; and advisory circulars. What is the pass rate? Pass rate using this method of instruction is 80% while nationally its only 33%. In some FSDOs, the pass rate is as low as 18%. The pass rate is high because we do not compromise quality and safety for the sake of cost or expediency. What kind of effort is required? A training day is between 6 and 8 hours of ground training with a single flight beginning or ending the day. Most students need to spend an additional 2 hours studying in preparation for the following day. Accelerated training is great way to achieve the required knowledge in a short period of time. This program gives you a solid foundation of knowledge in order to properly prepare you. We keep our pass rate high because of this solid preparation and are proud of it. Your reward: solid skills that will turn you into a quality instructor. How much notice is required? The ground school offers the student a well organized, professional training experience. I would recommend reserving your slot with a deposit a month ahead of time. Take advantage of the "bring a friend" discount and save even more money. Is this cost effective? For more information on costs related to room & board, see the sample budget for personal expenses during training.